The issue of the redesign of the Route 81-Almond Street corridor is especially important because of its potential to strengthen the connection between downtown and the University Hill area, where the educational and medical institutions are expanding and planning further growth. These institutions will not only transform the Hill, they have the potential to transform downtown, and with downtown, form the thriving nucleus of a newly robust regional economy. When the Onondaga Citizens League opted to “rethink I-81” as its study topic, it based the decision in part on the importance of improving the visual and physical connection between downtown and the Hill, as well as the knowledge that the deteriorating I-81 bridges will have to be rebuilt, not just repaired, in a few years. Another critical factor in the decision to study the impacts of I-81 alternatives was the preliminary conclusion of a nationally recognized engineering and design firm, a finding that made it possible to think realistically about the possibility of removing interstate traffic from the middle of the city. Growth in the Hill area had prompted a study of transportation needs of the area bounded by I-81, I-690, Thornden Park, and the southern boundary of the SUNY ESF campus. Recognizing that traffic congestion and parking problems on the Hill required more than just a study of vehicle use and parking space, the Syracuse Metropolitan Transportation Council (SMTC) undertook a comprehensive University Hill Transportation Study. The SMTC study findings form an important blueprint for growth in the coming decades. Completed in 2007, in partnership with the engineering and design firm Edwards and Kelcey, the Hill Study includes land use projections based on the planned visions of the major institutions and property owners in the area, an analysis of the needs of pedestrians and bicyclists, an overall mobility needs assessment, examination of a variety of case studies, and the beginning of a brainstorming process that outlines some forward-thinking possibilities for consideration, including an integrated transit network, parking strategy, and bicycle boulevard network, as well as a mixed use development plan to create a walkable, vibrant neighborhood. Among the Emerging Concepts presented by the consultants was an analysis that showed that removal of the I-81 viaduct might be feasible with an enhanced surface-level Almond Street – Urban Boulevard and relocation of the I-81 through traffic to I-481, with corresponding improvements to the merges of those routes. While a boulevard in place of the I-81 viaduct is a long-term project requiring extensive study, among the Final Recommendations of the Hill Transportation Study report is reconfiguration of the Almond Street corridor, including fewer lanes, modern roundabouts, and streetscape improvements in order to improve pedestrian and bicyclist safety, improve traffic operations and increase the incentive to walk between downtown and the Hill. The transportation study is based on the assumption that a comprehensive strategy has to focus on the movement of goods and people – not just cars – and that good land-use planning can alleviate traffic congestion, reduce the need for parking, and support transit, biking and walking. Even apart from the I-81 issue, SMTC’s University Hill Transportation study and its recommendations represent an exhilarating departure from the traditional approach to problem-solving. It offers the Syracuse metropolitan area a way to incorporate the community’s goals for quality of life, economic viability and environmental sustainability into the transportation planning process. Very soon, SMTC will launch a public participation project on behalf of the NYS Department of Transportation on the history, role, functions, and condition of I-81, to create awareness of DOT’s I-81 Corridor Study and to gather public input on issues and concerns related to I-81 and its environs. Ultimately SMTC, and DOT, hope to engage the community in the decision-making process related to future of I-81. 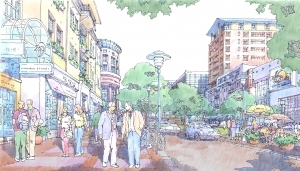 OCL’s “Rethinking I-81” study and this weblog are meant to inform and contribute to that process. This entry was posted in SMTC, Urban Planning on July 30, 2008 by OCL. It’s ironic that a city that was so vocal and concerned in 1927 about the possibility of an elevated railroad line creating a hostile barrier could allow one to be built between its downtown and its major educational and medical institutions 30 years later. What happened? Where was civic planning? Note that I-81 and the entire national interstate highway system were a part of post-World War II planning system to provide for fast ground transportation as a military advantage. The National Interstate and Defense Highways Act of 1956 authorized the biggest public works project in the nation’s history, and completely altered the course of America’s urban development, which would thereafter be based on the automobile. The roads had economic implications for the communities with easy access to these interstates, contributing to the growth to new areas, and shifting focus away from the local thoroughfares they replaced. The NYS Thruway had avoided going through urban areas when it was complete in the 1950’s. That led some local business interests to complain that the road moved business away from the city center. The north-south highway that became I-81 was previously intended to follow Townsend Street through downtown. Earlier (late 1940s) a boulevard that would run along Townsend had been conceived to relieve traffic congestion but the city didn’t have the money to construct the road. Ten years later, the federal government appeared with funding for the highway system and the idea of an arterial/elevation evolved. To counter the state’s plans, the mayor proposed a depressed highway which would run underneath a civic plaza near today’s Everson. The state opposed this, citing concerns about drainage and cost and the city backed down. The proposed elevated corridor was moved east from Townsend to Almond Street, farther from downtown. There the highway would only encounter what was considered substandard housing, most of which was to be demolished under Urban Renewal. At the time, the late 1950s, downtown Syracuse still had a bustling economy and a link with the University was not a major concern. 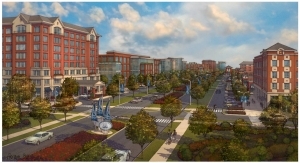 Downtown business and retail interests could not foresee the benefits of a connection to the expanding institutional complex on the Hill. Ultimately the forced compromise of an elevated I-81 though Syracuse came down to lack of public input, the community’s inability to enact a local vision, and an incomplete grasp of the long term implications of an elevated highway. This entry was posted in History on July 17, 2008 by OCL. History can give us perspective. 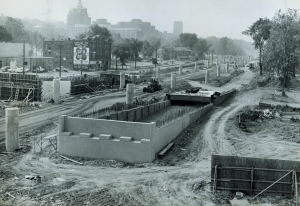 When considering the future of the I-81 viaduct, it’s instructive to look back at past transportation corridor decisions that had major and longlasting impact on the area. When the Erie Canal became obsolete in 1918, the city had to decide what to do with it. Little thought was given to the canal’s potential as an aesthetic feature for the city; assuming maintenance of the locks was not of interest to the city and the often malfunctioning bridges that spanned the canal impeded movement throughout the city. The canal was seen as a transportation corridor holding the city back in the booming 1920s – to get rid of it was not a controversial decision. The Washington Street railroad corridor, however, was an even greater divider of the city, but because its station was used by more people than the canal, decisions related to its fate were far more divisive. 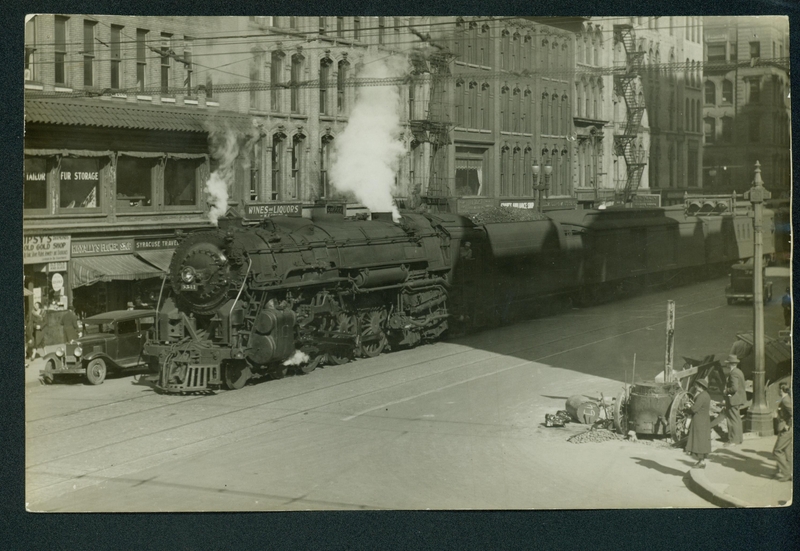 By the turn of the last century, every single passenger train on the New York Central ran down Washington Street and all the DL&W trains ran through the Westside, many of those freight trains hauling coal. AT STREET LEVEL! No safety measures such as flashing lights or arms existed, causing numerous vehicle and pedestrian accidents. Opening a window in a nearby building at the wrong time meant a face full of soot and smoke.How did the rail lines get there in the first place? In 1837 when the little village of Syracuse granted the perpetual easements to the Syracuse and Utica Railroad for a little set of rails, for trains that barely reached 20 MPH speeds, Washington Street was only developed for a couple of blocks before it ran out into the country. And it was convenient to the canal packet boat lands a block away so people could make their intermodal connections. Eventually, S&U RR became part of NY Central and technology and lifestyle changes made the decision a major problem by 1907.Any solution to the growing problem had to involve the agreement of the privately-owned railroads. Ultimately, two plans were advanced and went to public referendum. 1) Reroute the railroad far to the north. 2) Elevate the track just north of the Erie Canal, on a secondary right-of-way owned by New York Central. In an era when passenger railroad travel was a main mode of transportation, and downtown was clearly the hub of the city, the population couldn’t envision their major transportation center located away from the downtown. Also, the railroad interests wanted to remain downtown. In the ensuing public debate, some people envisioned a growing downtown, others a lessening role. People saw the elevated tracks in different aesthetic lights. The promise that the railroad elevations could be made attractive and the sense that the railroad interests wouldn’t cooperate if the public voted to relocate passenger lines outside downtown, led citizenry to vote the second, more expedient solution of elevating track. However, it was a very public debate with the issue of the aesthetics playing a major role. (Newspaper cartoon from the 1920’s courtesy Onondaga Historical Association). What the public couldn’t foresee was how the railroad would almost immediately begin to lose ground and how radically the transportation landscape would soon be altered. By 1962, when passenger traffic had nose-dived, NY Central moved the passenger lines to the Northern route, the original rerouting plan for trains, and the route that is still used today. And the old elevated railroad tracks became the route of the East-West Highway, I-690. In the 1950s and 1960s, when the route for an elevated Rt. 81 was being planned, the negative aesthetics were again raised by some, but the decision was not subject to a public referendum. These historical precedents show us that there are several factors that should be considered by a community when it is planning transportation corridors, in addition to simply cost and the fastest movement of traffic. The design and location of transportation corridors can have long-lasting impacts on quality of life issues and adjacent land use economics. This entry was posted in History on July 3, 2008 by OCL.